I am from Chennai. I am an Organic and Integrated farmer (8 years in farming). Growing wheat grass is not a problem if I have the seeds. I have 6 acres of land. The setup is good. Hari, I think you're better off than most of us! Good luck. Any chance you could get some cool climate grass like timothy? Guinea pigs really love it! 1. Is the sun-board called sanmaika in Hindi, the one which is used as a bathroom door or as a shield to the wood on the cupboards? 2. Can i grow timothy hay and wheat grass at home? If yes, then how as ma parents will not allow to buy it online. There is a lady who sits with her cow in my area. I asked her where does she gets grass for her cow. She told me of a place in Mumbai itself, its named Kanjurmarg but she said she is not sure if i will get timothy hay there. Do you think this place will have good quality and pesticide free timothy hay? If not then which other place would you recommend? Also does booster juice means sugarcane juice? 3. I had gone to Big Bazaar to buy 100% polyster blankets. It looked like the ones humans use in winter. Is that the fleece you are talking about? If yes then my neighbour has a similar kind of a blanket but it doesn't wick water through it. I tried putting water over it and kept a napkin underneath it. The blanket became wet and the napkin was dry. 4. Is it compulsory to give pellets to the guinea pigs? Cant i just give them lots of vegetables instead? My guinea pigs are not very picky. They eat all the vegetables i give them, carrots, cucumbers, green bell peppers, french beans, tomatoes, coriander, etc. 5. 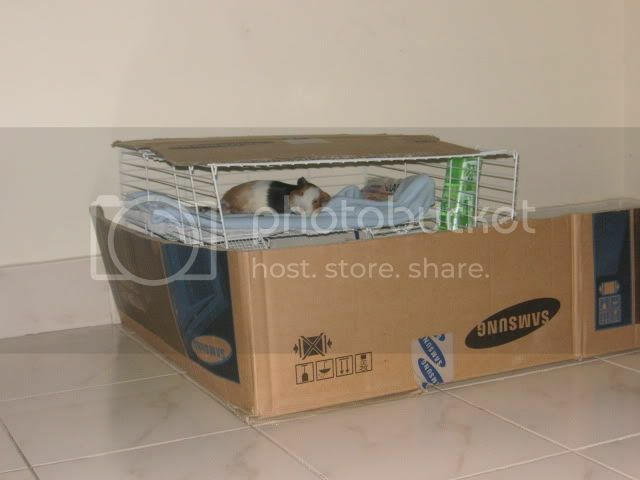 Can you post pictures of your cardboard cage? My house is getting renovated and i will be able to build a new cage for them after that. So for the time being i can use the cardboard cage. 6. My friend loves my guinea pigs and he wants to buy guinea pigs too. He stays in Mumbai and he goes to office from 10 a.m - 6 p.m. During this time there is nobody at his home except for his grandmother who cannot climb stairs and my friend's room is on the 1st floor. He is planning to keep the guinea pigs in his room. He will be making a sun-board cage with fleece as the bedding. He has a terrace on top of his room, but his room is always cool. Do you think he should keep guinea pigs since he is out the entire day and his grandmother cannot climb stairs to give food to guinea pigs all the time? He says he'll give the guinea pigs veggies in the morning when he is leaving for office and give veggies again when he is back and keep hay 24 hours in their cage. Do you think this is fine? I hope Prince and Princy don't live together! Otherwise they will make babies very quickly! 2. You cannot grow sufficient amounts of grass/hay in your home unless you have a large farm. 4. It is greatly preferred. Feeding only vegetables must be done with great care and attention to maintaining a balanced diet. 6. Most of us work full time. Our pets are home alone all day. They eat pellets and hay while we are gone. They are given vegetables once or twice a day when we are home. Thank you rshevin nad Waddles for replying to my post. Yes, rshevin Prince and Princy stay in two separate cages. The blanket that my neighbour has doesn't wick water. It stays wet and the absorbant layer under it stays dry. Is it how it works? Shouldn't it be vice-versa? Waddles, i named her Princy after my friend's turtle. Pooja, did you get my email reply that I had sent to you some time back? If not, let me know, and I'll forward it again. There is a picture of the sun board/coroplast on the previous page of this thread. It's not the same stuff used to panel doors and cabinets; it is the plastic used to print banners and signs. As for the cubes, the easiest thing to do is go into a high-end pet supply store and buy a pen that is used for small dogs or rabbits. Use that as a boundary to the cage. These same shops can make one for you according to the exact dimensions that you want. If your budget is more generous, go into a high end home furnishing store, and you'll probably find the exact same cubes that are used by most people in this forum. They will be costly, but worth it! I actually don't have any contacts in Mumbai or information on who will have supplies, but after doing some Google searches, I came across loads of companies carrying piggy supplies (lots more than Bangalore)! Rshevin is right about the hay. Lots of people here grow certain grasses as a treat, but give unlimited Timothy hay on the side. If you have a garden, it might be alright. If you stay in a flat, you probably won't be able to grow as much as needed! "Booster Jus (juice)" is a chain restaurant serving smoothies and other blended drinks. You'll come across them in malls or in shopping areas. Any of these types of stores (not necessarily this specific chain) will carry wheatgrass that is blended into the drinks for added nutrients. Find a store that has wheatgrass growing in flats, and ask for the number of their supplier. The supplier can supply you ready made flats, and can probably guide you in the direction towards finding clean hay. I don't recommend getting hay from Kanjurmarg, unless this place exports their product. The hay is many times kept in damn areas, so it grows mold and has bugs. Still, it doesn't hurt to give a call, and go see for yourself. You could get lucky! The fleece blankets are 100% polyester, but are soft, like a baby's blanket. Ask for polyester fleece, rather than wool fleece. Some fleece wicks from only one side. Most fleece requires 3 or 4 washes before it properly wicks water or urine. Make sure to keep absorbent cloth or towels under the fleece. I agree with Rshevin: pellets are a necessity in between meals, in order to maintain a nutritious diet. It is hard to do in India if you cannot find a constant supply, I have been there! In Mumbai, though, you should be able to find something with a bit of effort. I also agree with Rshevin about the schedules. I leave the house by 8:30, and come back after 5. Some days I don't even have time to talk to the pigs, aside from when I prepare their meals. Here are some pictures of the cardboard setup. It is not ideal for long term, but works until you can get the materials that you need. 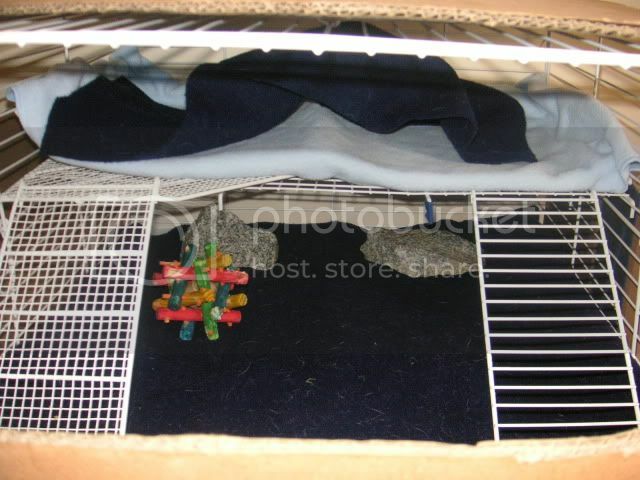 The outside of the cage is made from a refrigerator box that was cut in half and spread out. I had it placed against a corner of the house, so that the corner would create 2 sides of a rectangle, and the cardboard would complete the other half. The metal cage you see inside is a pet store cage (too small!) that I turned onto its side to create a small 2-leveled house. This is a small kitchen area that was segregated from the rest of the cage with some more cardboard. 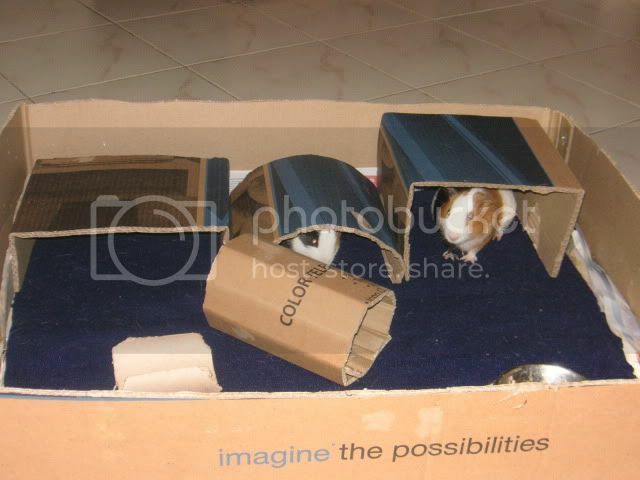 Using cardboard, I made lots of little hideys, along with a small box that I could keep the piggies in while I was holding them or having them sit with me. When using the cardboard, try to ensure that the cardboard does not get wet, either by using LOADS of absorbent material or by using a shower curtain underneath your bedding. 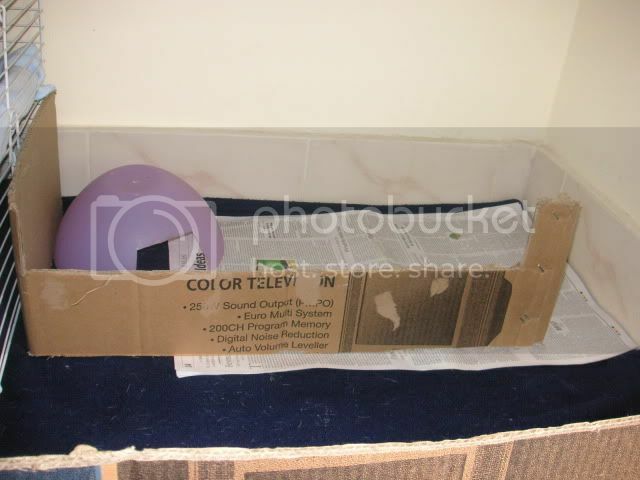 When cleaning the cage, stick the cardboard in the sun for a little while to kill any germs and dry up any moisture. Also, use lots of towels! You'll see that I have newspaper under the fleece, but this was a temporary solution until I could find some good quality towels for absorbency. I still use newspaper now, but under 2 layers of towels. I got your mail Puja. Thanks a lot for everything. I managed to get the polar fleece blankets from Big Bazaar and sun-board till now. I still have to search for other things. I will keep u updated. How big should be a cage for two piggies? Pimpinpuji, it's clear from all your posts that you have done all you can to give your piggies the best life that you can and it's wonderful that you want to help others in your country to learn from your experiences. The only comment I would like to make for anyone looking in - those wire ladders in the temporary cardboard cage example - can be dangerous if piggy claws, toes or feet slip through the wires while they are climbing or running up and down, and could cause a break, especially if they get a fright and try to jump in a hurry. I used to cover mine with a piece of carpet cut from a cheap, thin piece of carpet, attached with a few cable ties. Unfortunately I don't have a photo. Also there are lots of ideas for safe ladders in cavycages.com and of course here on GL in Show Your Cage. Jiggypiggy, thank you! I have put in a lot of effort, but my little brats are all the happier for it, and I'm hoping all that happiness will come in handy when they have to make the journey with me back to the US. If I had been in the states, things would have been much easier, but in India, we have to get a little more crafty and imaginative. I've gotten so many tips and tricks from this forum, that I decided to compile it into a thread where someone could find what they needed! I have it easier, since I make trips home every 6 months and bring back pellet and hay supply. Thank you for mentioning about the ladders! It didn't occur to me to warn against them! I no longer use the ladders, but I'm sure your idea will come in handy one day or another. Hey Pimpinpuji! I am new to the forum and I am from India. 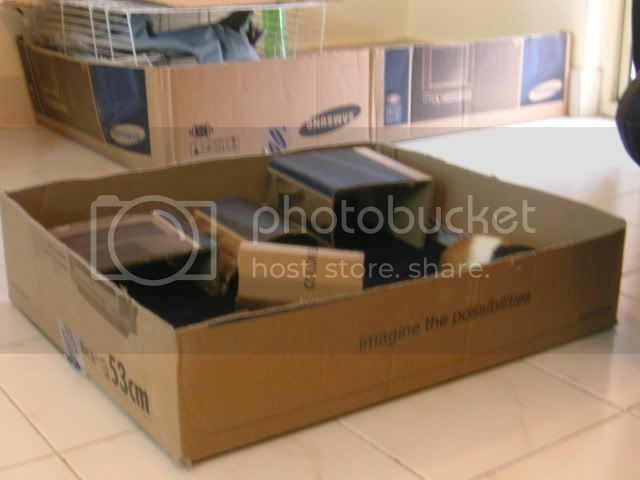 Do you know where I can get the cubes for the cages in India? Sam_sam, just scroll up a bit. It's all written there! Thank you pimpinpuji..:D Can you send me the link of the piggy supply companies in India. I can't afford the pet shop pens.. Is there any place I could get the grids from..
San_Sam, I actually don't have those contacts with me, because they were not in Bangalore, where I am based. I just saw them on the net after doing a search. Google is your friend! Don't be afraid to use it! The only other places with actual cubes will be more expensive than the pet shop pens. What is your budget? You'll have to get a little creative with what options you've got. Places that sell household supplies such as piping and wiring may be a good place to start. Look at all the stuff and see how you can work with what is available. One member on here had used chicken wire, but I don't know how well it worked out. Aim for something sturdy and safe, that your piggy (piggies?) will not chew through. If your piggies are on the floor in a safe area, you could perhaps make them a base from the coroplast, and let them wander around or stay in the cage if they choose to do so? Just make sure that there are no loose wires or places for your piggy to get stuck. Take a look at the "Show your cage" threads and get some ideas. There are gorgeous cages made from coroplast, wood, and even thick plastic. Good cages are not necessarily costly. 1. Can i use aluminum grids instead of the dog pen grids? Aluminum is easy to find, easy to clean and wouldn't rust. Is the dog pen grids made of 'lokhand' and coated with PVC? I don't know what is lokhand called in English. 2. What is timothy hay called in Hindi? People here have not even heard of such a name. 3. Does anybody know any guinea pig rescues in Mumbai, India? My friend wants guinea pigs but he doesn't want to buy from a pet shop.. I would carefully choose whatever cage material you have available with safety in mind. Some pigs chew on bars quite a bit. Aluminum would likely be a poor choice for them. The PVC coated one, you would have to see if they were getting down to the metal. Standard ferrous metal grids are what most people use (they are coated). Aluminium is highly toxic - if ingested - in large enough amounts. We all get some aluminium into our systems in small amounts. There is currently a case ongoing in the UK. A lady died 15 years ago. She lived in a region where aluminium was accidentally released into the water supply. When an autopsy was carried out, it was found she had abnormal amounts of aluminium in her brain.